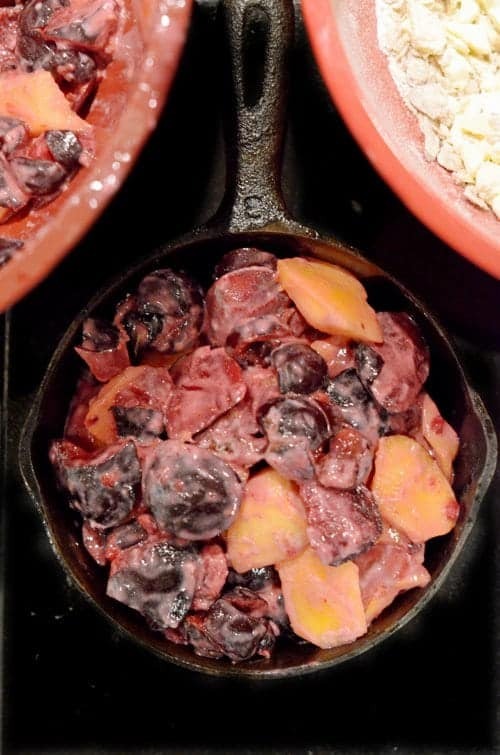 Stone Fruit Crisp features a blend of seasonal stone fruits. Showcasing an array of colorful plums, bing cherries, and fresh peaches, this dessert features the best of early summer. Taking it up to an even higher level, it’s topped with a nutty granola that’s laced with chocolate chips. 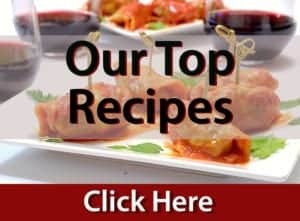 Lately, we’ve been inundated with requests to come up with new recipes using specific brands and foods. The folks from Golden Girl Granola reached out to us for just such a reason. They were kind enough to send us a bag of their artisan granola of our choice. Naturally, we went for the chocolate decadence. I mean, why wouldn’t we? A while back we made a peach crisp on the grill, it was a big hit with a lot of people. 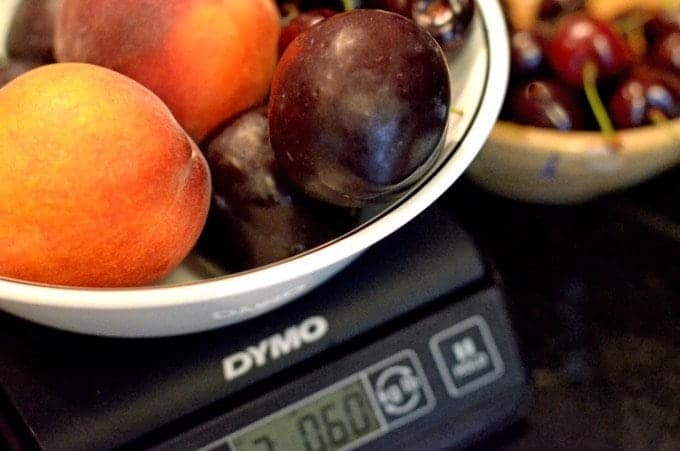 Besides peaches, we’ve had a variety of seasonal fruits on hand lately. Since we all know that left uneaten they don’t last long, I decided to put another crisped dessert entrée together, this time using our cottage oven. 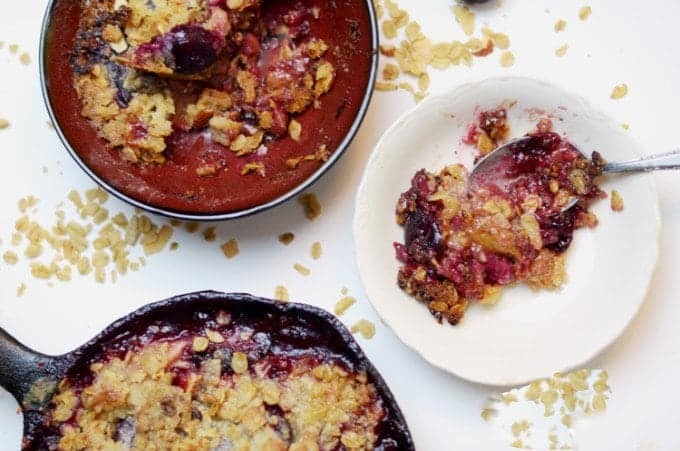 For this stone fruit crisp, we mixed a couple of pounds of peaches, plums, and bing cherries together. The deep colors of these fruits overwhelmed me with their beauty and freshness. 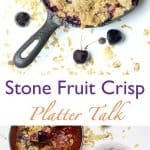 We’re fortunate that our boys are big eaters of these fruits, this stone fruit crisp was going to be one more way for them to enjoy it. 2 lbs seasonal stone fruit pitted and cut into 1 inch pieces. In a medium bowl, stir together 1/2 cup flour, 1 cup sugar and granola. Using a pastry blender or two knives, cut in butter until coarse crumbs form. 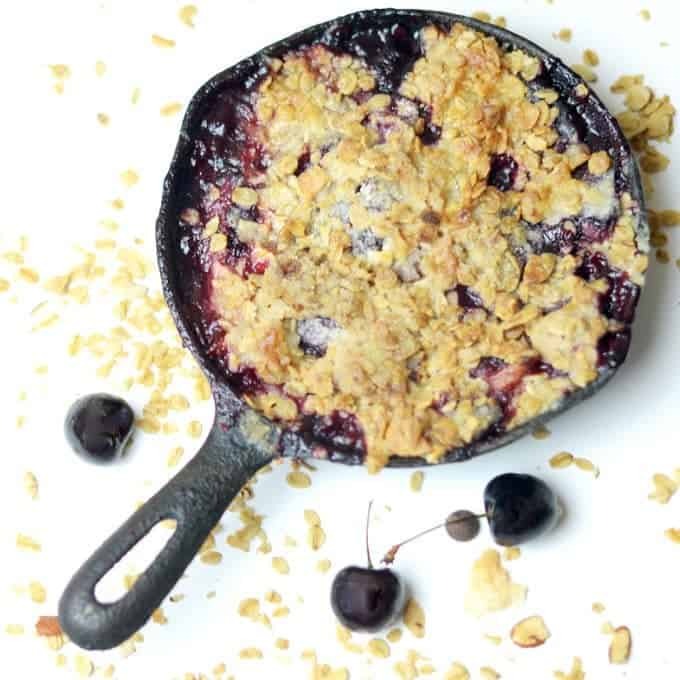 In a shallow 2-quart baking dish, toss fruite with remaining 2 tablespoons sugar and 2 tablespoon flour. Place dish on a rimmed baking sheet. Bake until topping is golden brown, 40 to 45 minutes. Let cool 20 minutes before serving. They look so fruity and decadent. I’m lovin’ them! What a delicious looking summer dessert Dan! Pinned and shared! I love making desserts with stone fruits and yours looks incredibly fresh and delicious! This looks great! 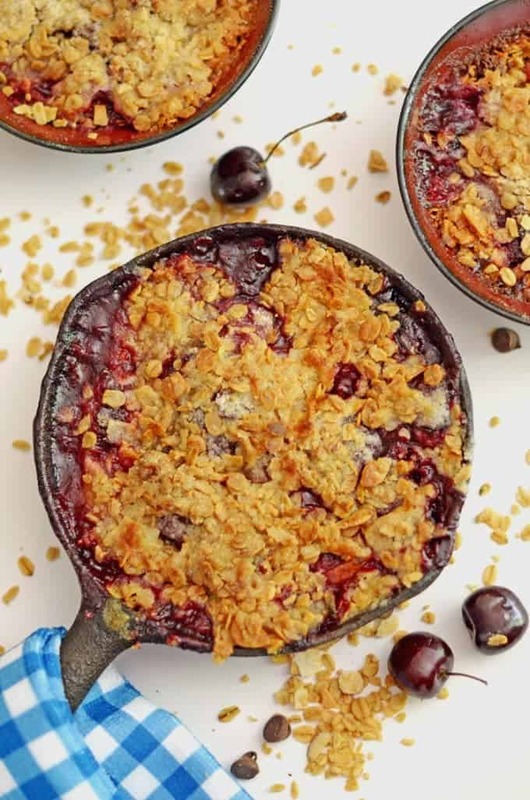 My kids love fruit crisp…we’ll have to try this! 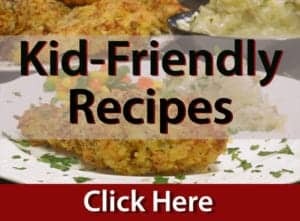 I am so in love with this recipe! Gorgeous and sounds delicious! Thanks so much Erica! It’s wonderful to hear from you! Very fruity, very crispy and super delicious guys! This summer dessert looks amazing! Thanks so much, Catherine! We love to eat summer! Absolutely gorgeous, Dan! I love love loveeee stone fruits. They’re so juicy and sweet, and definitely make you feel like it’s summer. 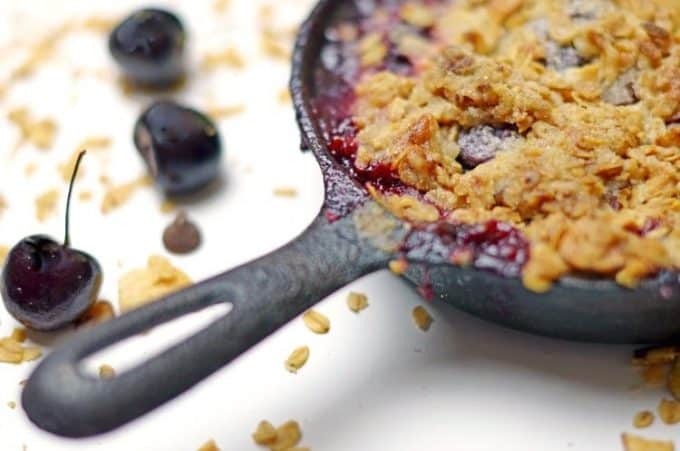 I can just imagine dipping my spoon into that skillet and getting that burst of warm, fleshy fruit with the crisp granola topping…mmmm heaven!!! Add a scoop of ice cream and I’m never leaving your house! wow! This looks amazing and I love all these fruits too! Absolutely stunning! Guys, just perfect. Looks great. I just love the combination of fruits and that granola topping just makes it rustic. It’s healthy too with all the fruit and the granola, right? So I won’t feel guilty with a little gorging. We run a guild free kitchen, Patty. Please stop by sometime! This looks amazing and great photos too!